One of the most popular features of My WebCam over the years has always been the ability to set up your webcam to make Timelapse sequences. Very often these sequences can be beautiful as well as being a great way to view a video summary of the day. You can set the webcam up to take a snap every 10 minutes. 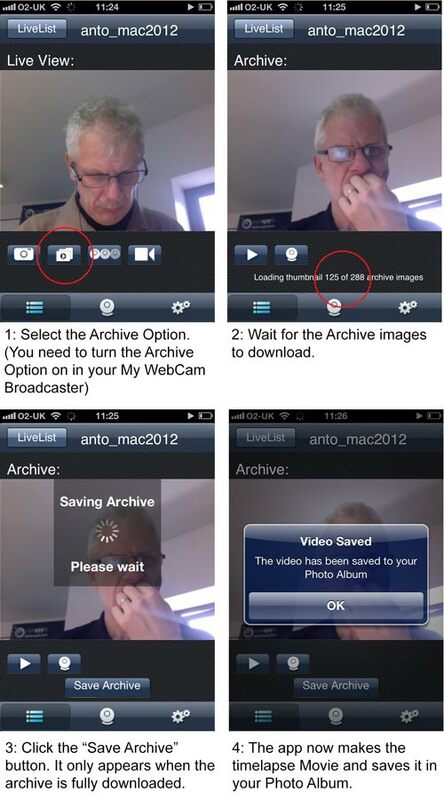 288 snapshots are collected and made into a movie you can view from within the My WebCam Mobile apps. Now we have made this service even better. You can save the Timelapse Archive as a Movie. It gets saved as a Movie into the Photo Album. From there you can share it on FB, Twitter or YouTube or embed into a blog. Here is one (not one of the beautiful examples) that I made a few days ago.